I'm not a very big fan of Shakespeare's comedies, because, let's be honest, the jokes may have been funny at his times, but they are not funny anymore. So the "funny" scenes usually leave me abashed and perplexed. But luckily there's much more to As You Like It than just humour, so the book was not disappointing overall. The style of the play may be characterized as pastoral: all the good guys leave the court in favour of a simpler life in the forest with the shepherds. As usual, there is also love, cross-dressing, a fool and some court intrigues, spiced up with a few nice philosophical sayings. 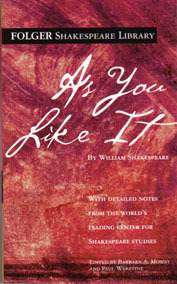 By the way, As You Like It is the play where the famous "All the world's a stage" speech comes from. I didn't know it! "...honesty coupled to beauty is to have honey a sauce to sugar." "O, that woman that cannot make her fault her husband's occasion, let her never nurse her child herself, for she will breed it like a fool!" "...take a good heart and counterfeit to be a man." It's everything you expect from a Shakespeare's comedy. I love Shakespeare and I think I've read all of the comedies. I may be mistaken, however. I was trying to read all of his plays for a while and was working my way through the histories. Then I was having trouble reading and working my way through his plays wasn't as imperative anymore. I may get back to it though. I think I've read all the tragedies and around half of the comedies, but only one history. I also want to read all his plays some day... Some day!